Intercultural understanding is incorporated as a vital element of both academic and non-academic education at Nigawa Gakuin. The vibrant programs that are offered to students are continuously expanded year by year and supported by partner schools around the world. 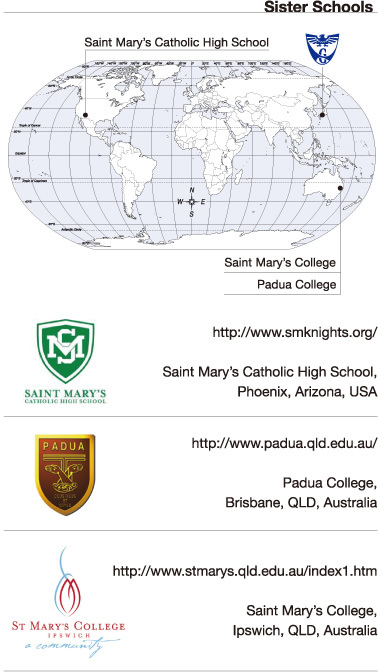 Each year, students in 1st and 2nd grade of high school have the opportunity to spend a year at one of our partner schools in the United States or Australia. Students are placed with host families and are fully immersed in the local culture and community, giving them first-hand experience in communicating with people of different cultures and backgrounds. As they attend classes as regular students at the host school, credits earned are recognized by Nigawa Gakuin, enabling them to return to their previous grade without repeating a year. Students who participate in these programs return to Japan not only with improved language skills, but also as mature individuals who have learned to understand and appreciate both foreign and Japanese cultures more deeply. Nigawa Gakuin accepts long-term gap-year students from all of our sister schools. These students tend to have a strong interest in the language and culture of Japan, and they attend school for up to one year as students of Nigawa Gakuin. Their presence offers other students an opportunity to experience intercultural communication right here in Japan in their daily routines. Nigawa Gakuin regularly hosts visiting international students from our many partner schools around the world. These visits provide ideal opportunities for our students to introduce the language and culture of Japan to students of a similar age from English and non-English speaking countries. Nigawa Gakuin families have been very generous in opening their homes to international students, both short-term and long-term. Such programs have enabled students to actively use the language skills that they acquire in English classes from day to day, and the friendships that they make are often long lasting. In addition, the cultural stimulation that such exchanges provide tends to motivate students to learn more about the world in general, encourages a more serious approach to language studies and sometimes inspires them to apply for study abroad programs themselves.